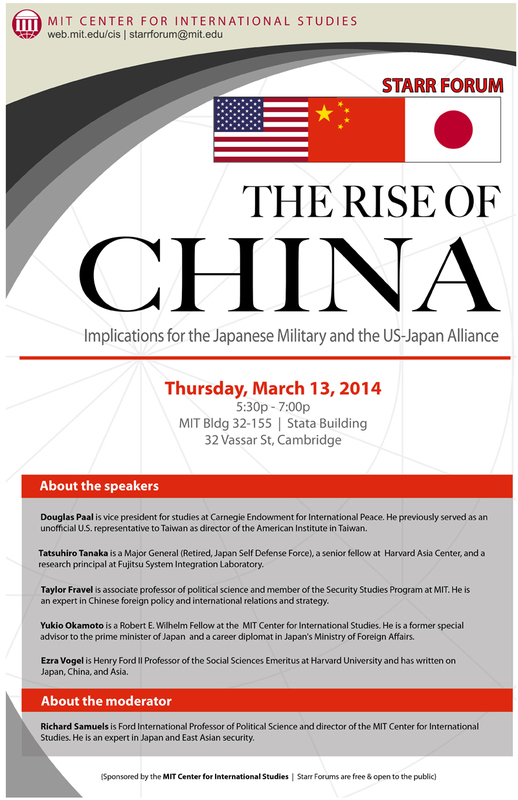 Implications for the Japanese Military and the US-Japan Alliance, a panel discussion. Taylor Fravel, associate professor of political science and member of the Security Studies Program at MIT, studies China's foreign and security policies. Tatsuhiro Tanaka, Major General (Retired, Japan Self Defense Force), senior fellow, Harvard Asia Center, and research principal, Fujitsu System Integration Laboratory. Ezra Vogel, Henry Ford II Professor of the Social Sciences Emeritus at Harvard University, has written on Japan, China, and Asia. Douglas Paal, vice president for studies at Carnegie Endowment for International Peace, previously served as an unofficial U.S. representative to Taiwan as director of the American Institute in Taiwan. Yukio Okamoto, a Robert E. Wilhelm Fellow at the MIT Center for International Studies, is a former special advisor to the prime minister of Japan and a career diplomat in Japan's Ministry of Foreign Affairs. Richard Samuels, Ford International Professor of Political Science and director of the MIT Center for International Studies, is an expert on Japanese studies.